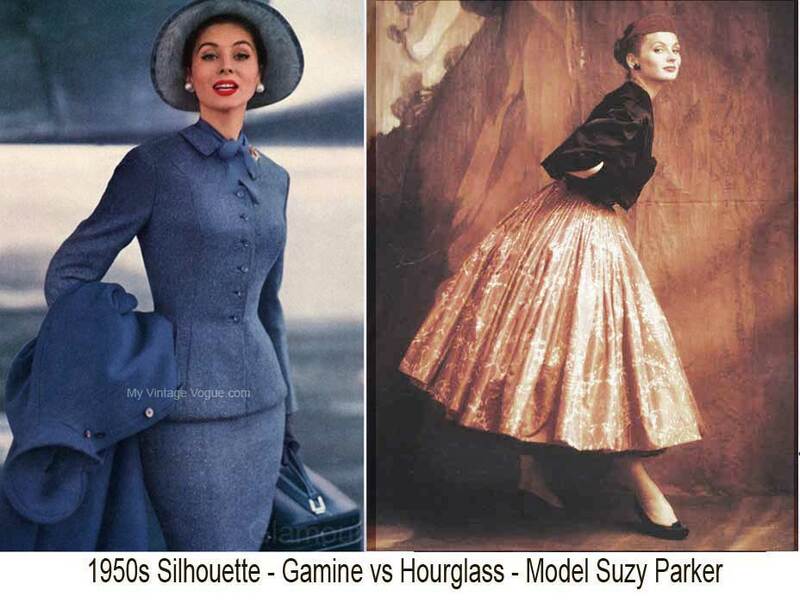 1950’s Fashion – Women’s Figure and Silhouette. The new silhouette demanded a new figure and a veritable deluge of undergarments filled the lingerie departments. There were two distinct shapes,the waif like gamine figure epitomized in movies by Audrey Hepburn and the more womanly hourglass figure represented by Grace Kelly, with tiny waists, padded hips and circle skirts. It was also the golden age of the fashion model – with the ‘big three’ in 1950s fashion models being Jean Patchett, Dovima and Suzy Parker. 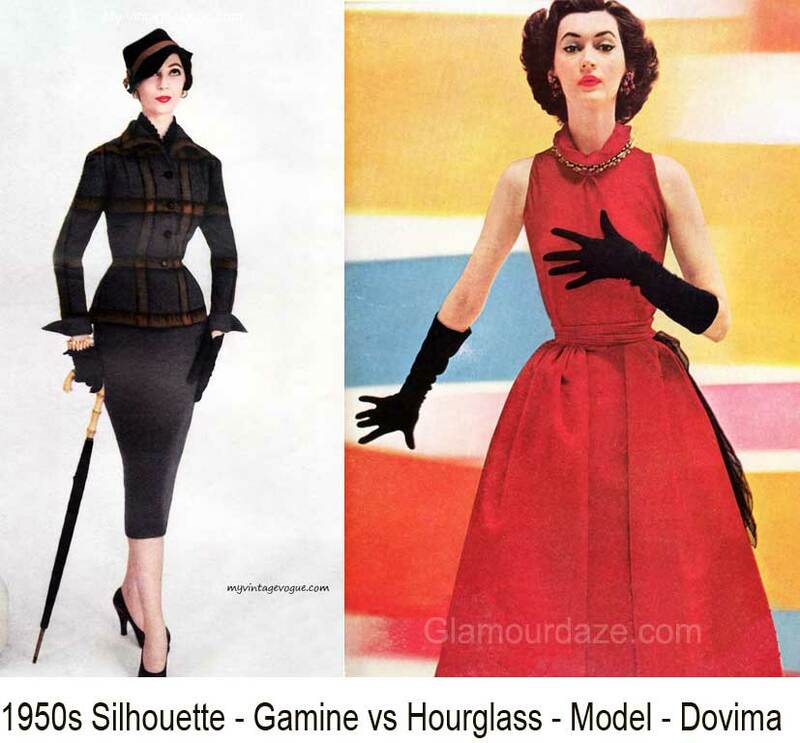 These women were seen in all the top style magazines – showcasing the two distinct skirt and dress lines which define the 1950s from the abundant Dior inspired umbrella look to the new pencil skirt. 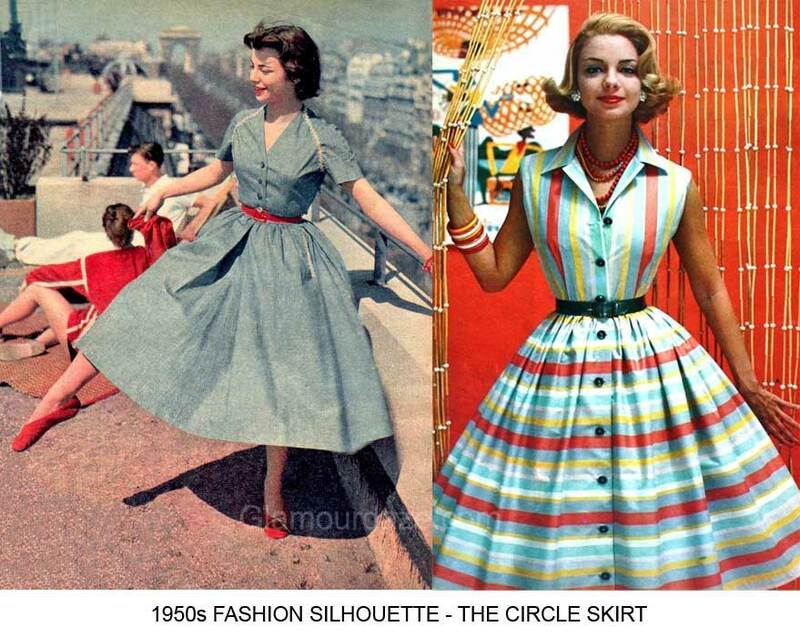 No matter what skirt you wore, the silhouette was to emphasize the curves. Large bust and hips and small waist. Thus – with these austere instructions, women across the developed world sincerely determined to achieve this ‘ feminine’ look by squeezing themselves into restrictive garments that echoed Edwardian times. 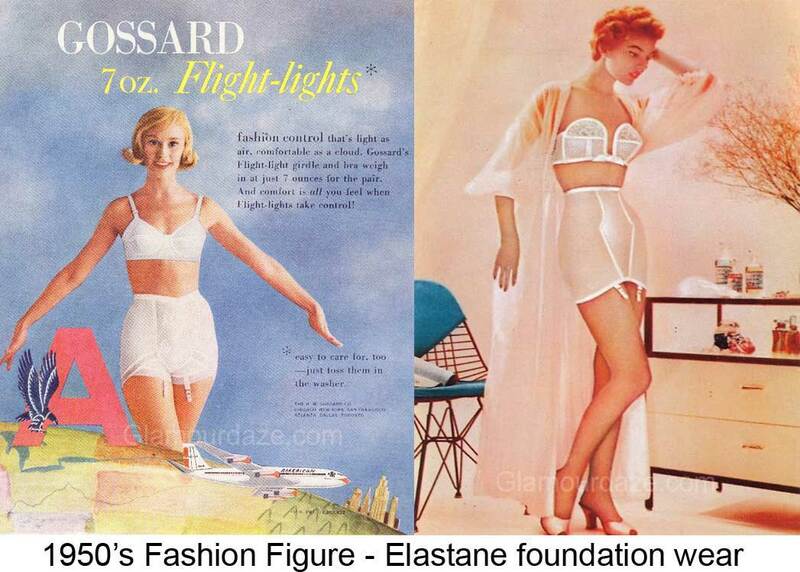 Admittedly, fabrics like nylon and Elastine [ Lastex ] made wearing girdles more tolerable and even pleasant. The Lastex /cotton roll on girdle with attached suspenders , which appeared in 1950 may have bade farewell to the old boned corsets and was of course a welcome relief to women. However in order to achieve the new hourglass look demanded by Paris designers such as Christian Dior, foundation wear became a necessity. No self respecting 1920s flapper would have tolerated this sort of dress code. 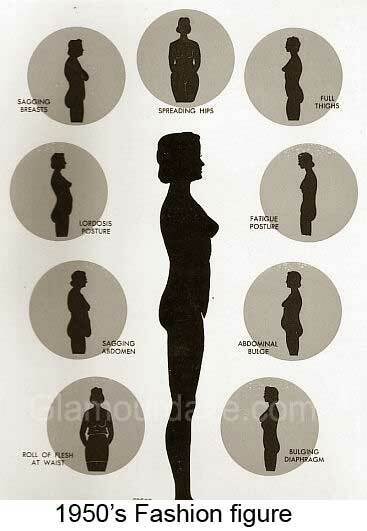 Girdles for a more Feminine figure. 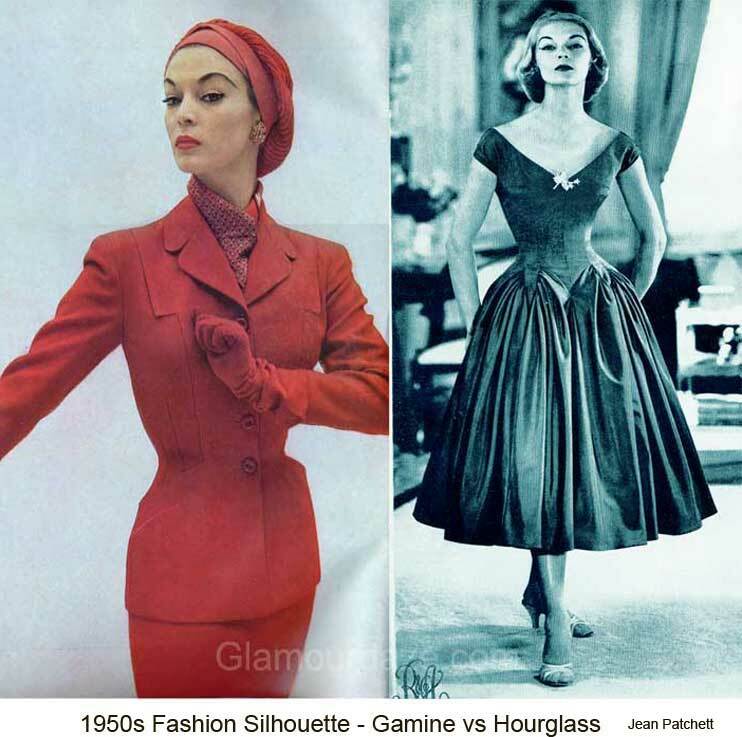 The mode for tiny waists and accentuated hips and bust, along with the softer synthetics now available since the war,created a foundation wear boom, and with the tighter fitting look becoming increasingly popular; the sheath dress, the gamine look made famous by Audrey Hepburn, foundation design became a beauty science. The French bustier, which sheathed a woman’s frame from the waist down over her hips was a sought after wedding foundation garment. Shoulders were still wide but softer, which helped emphasize her small waist and wide hips. Silhouettes however were many and varied when it came to outer-wear, from trim bodices, knee length pencil skirts, boxy jackets to wide circle skirts. But defining all dress wear was the 1950s fitted shoulder cut which then bloomed at the waist and hips. This overtly romanticized vision of womanhood persisted well into the 1960’s. I’m not sure I’d agree that the ’50s girdles were more comfortable than corsets! In hot weather, those elastic garments were hellish, not to mention hard to get in and out of. I’m a lot more comfortable in a corset, in part because it isn’t elastic but cotton.